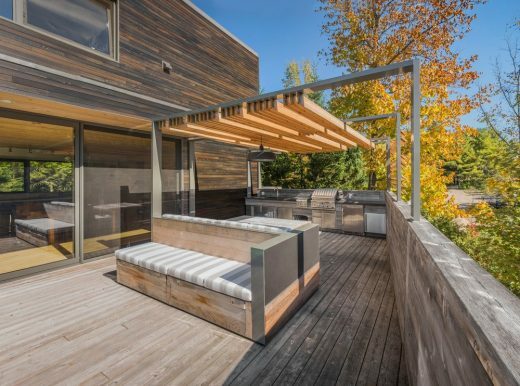 Interior designer Martine Brisson designed a spacious, balanced patio for two people with a deep passion for contemporary design. 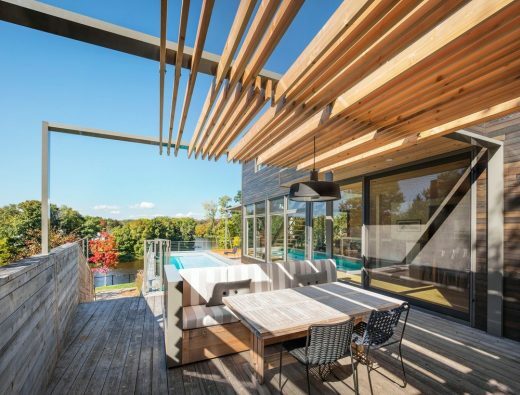 The project won the award for best home terrace at Quebec’s Grands Prix du Design 2015. 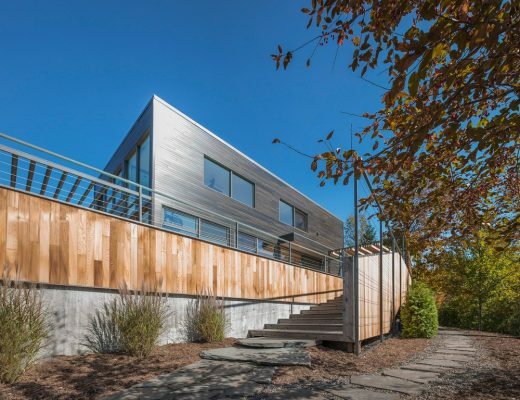 Maintaining harmony with the architectural concept of the house, designed by architect Bernard Perreault, the terrace is an extension of the interior. The young homeowners wanted a space suitable both for festive gatherings with friends and for family relaxation. 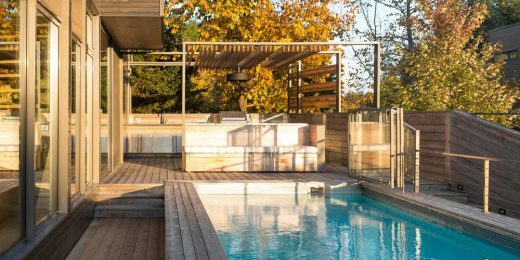 They required a full outdoor kitchen, a dining room and a play area for children, while making the most of the existing swimming pool, which enjoys ample sunlight. 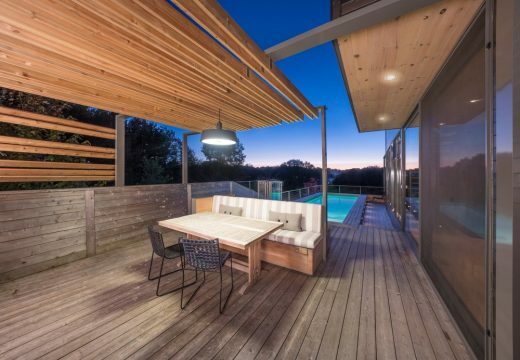 The large cedar pergola is the centrepiece of the understated, contrasting design. 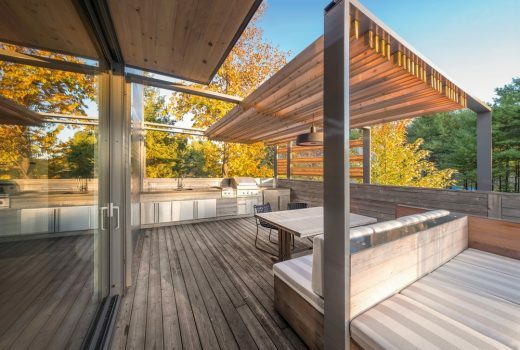 The pergola’s shades, hanging from a custom-made aluminum structure, diminish the intensity of the sun while creating a play of ephemeral lines and diffusing light in golden hues. Slats on the side provide privacy and a structure for climbing plants. 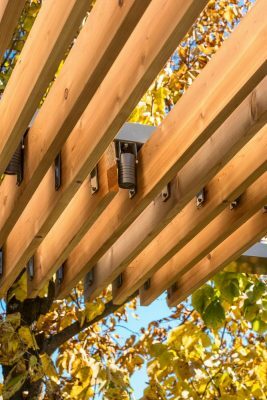 The pergola’s warm colours contrast with the lighter tones of the weathered-wood floor. 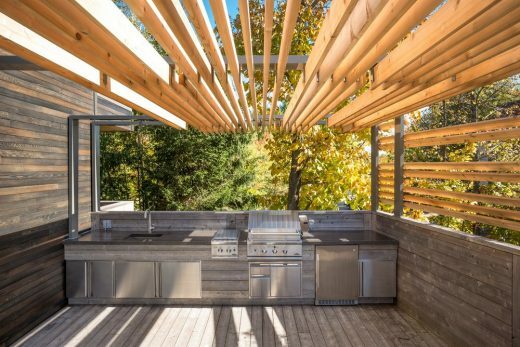 Boards were reclaimed as finishing materials for the kitchen, resulting in subtle and effective integration coordinated with the stainless-steel finish of the appliances. Two back-to-back banquettes, one in lighter wood, are designed as a single piece and form the space’s central element. On one side, people sit down to eat, while the other side is geared to play and relaxation. The banquette includes integrated storage. One side of the seat is covered in slate to add a playful aspect and allow children to use the space as they place. 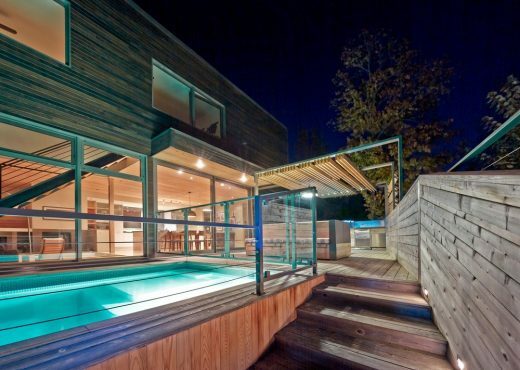 The pool echoes the lengthwise spread of the patio, meshing with the house’s linear architecture. 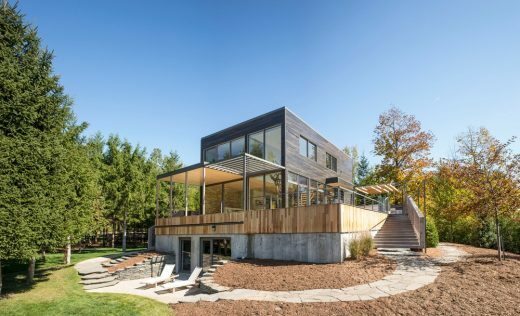 The required safety fence is made entirely of glass, preserving the space’s fluidity. After dark, the pool becomes a beacon, casting bluish light that gives the space a theatrical, soft ambiance, perfect for long, relaxing evenings among friends. Before engaging in training as an interior designer, Brisson began her professional life as a lyric soprano. It was during her international tours that she cultivated her talent for design and her love of architecture and spaces. “I always had a little notebook and a pencil so I could sketch the places I visited,” she recalls. After working as an on-stage artist, she became a fashion designer and opened a women’s clothing boutique in Montreal. A few collections later, she launched her career as an interior designer.